Experience Oahu's breathtaking tropical landscape from above on this 45 minute helicopter tour. Let us take you to our secret places in Oahu! 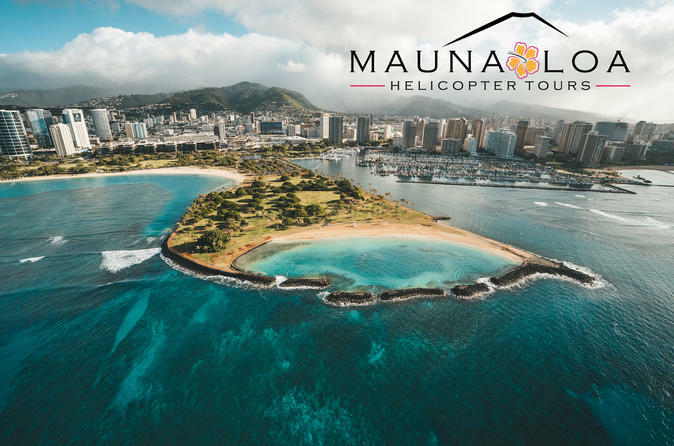 Our exclusive helicopter tours of Oahu depart from Honolulu Airport and offers breathtaking views of the Honolulu skyline, the iconic Waikiki shoreline, Koko Head, Makapuu Point Lighthouse, Kailua Beach, Chinaman’s Hat and the pristine waters of Kaneohe Bay. We then move on to Kaaawa (Jurassic) Valley, Sacred Falls, and the panoramic Dole Plantation. Your tour will close with a slow flyover of Pearl Harbor and the USS Arizona. . This is offered as both a doors on and DOORS OFF Tour! Check out our reviews on Trip-Advisor. Bookings for 1 -7 Passengers available. Please note that tour departure times may be subject to change.. We will confirm your exact departure time no less than 24 hours in advance of your tour. Experience one of the ultimate VIP helicopter tours of Oahu in luxury. Depart Honolulu airport and begin your helicopter adventure by flying over Waikiki’s shoreline, where the modern metropolis of Honolulu meets the white sands of Waikiki’s iconic beaches. Your tour will continue down the leeward coast to Diamond Head, Koko Head and the historic Makapu’u Point Lighthouse. Continuing North up the windward coast, you will pass over Kailua Beach, the famous landmark Chinaman’s Hat and the pristine reefs of Kaneohe Bay. The tour will continue North to Jurassic Valley and Sacred Falls. You will finish your tour with a slow flyover of Pearl Harbor and the USS Arizona before being returned to your original departure point.